How Do You Benefit From the Qur’an? When you desire benefit from the Qur’an, then bring your heart together during its recitation, listen heedfully and have the presence of the one who is being addressed and spoken to, since it is a speech from Him, the Sublime, to you, upon the tongue of His Messenger (صلي اللهُ عليهِ وسلم). That which produces the required effect. A place which receives this effect. The condition which is necessary to receive such an effect. The absence of that which prevents this effect from being obtained. This verse has included all of the above with the most concise and clear of wording, which is most direct in expounding the intended meaning. His speech: (Verily, therein is indeed a reminder…) is an indication of what has preceded from the beginning of Surah Qaf to the present and this constitutes that which produces the desired effect. 70. To warn whoever is alive and justify the word against the disbelievers. And His speech: (…or who gives ear…) the one who directs his listening and the perceptive faculty of his hearing to what is being said to him, and this is the condition of benefitting and receiving the desired effect from the words (that one hears). And His speech: (…while he is heedful) meaning his heart is present and witnessing, not absent and unmindful. And this is an indication of that which prevents the desired effect [from the Book of Allah] from being obtained and that is the forgetfulness and absence of the heart from understanding what is being said to it, looking at it with care and pondering slowly and carefully over it. So when that which produces the effect and that is the Book of Allah; a place which receives the effect and that is the heart; the necessary condition, which is paying attention; the absence of that which prevents the effect and that is the hearts occupation and distraction away from the meaning of the speech and its turning way to something else are all present, then the effect will be obtained and realized and that is benefiting from the Qur’an and its remembrance. This entry was posted in Uncategorized and tagged Benefitting from the Qur'an, Ibn Al-Qayyim, Listening to Qur'an, Recitation of the Qur'an, Surah Qaf. Bookmark the permalink. 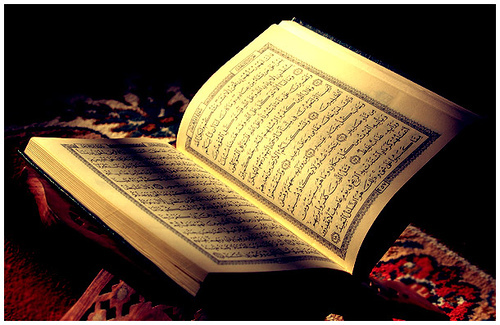 1 Response to How Do You Benefit From the Qur’an? Often we get lost in the mechanics and lose the spirit behind our acts of worship . . . we recite the ayaat of the Quran beautifully, know the translation very well and can even analyze the ayaat grammatically. But with respect to the implementation and spreading that message to others we neglect our responsibility. May Allah make us like that fertile land that receives rain and then not only becomes productive itself but also benefits many others. Ameen.